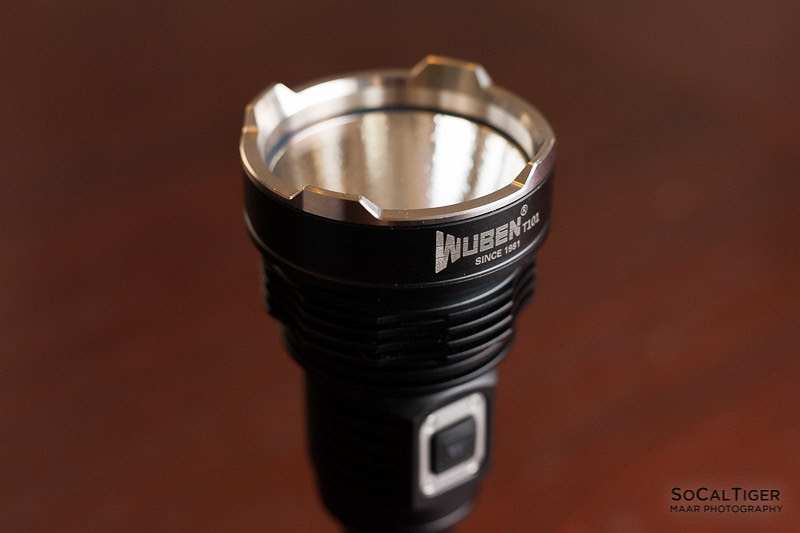 The Wuben T101 is Wuben's newest flashlight in their "T Series". 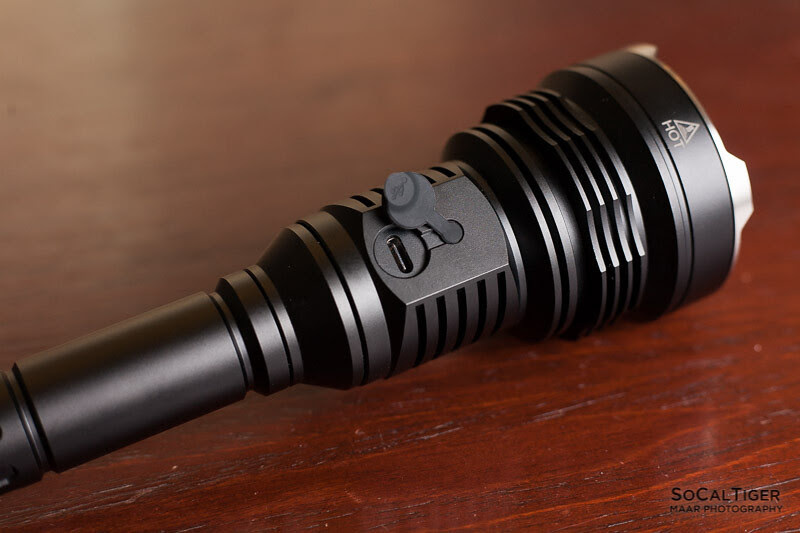 The T101 uses the CREE XHP70 emitter in an OP reflector and is powered by 2x18650 batteries in series. 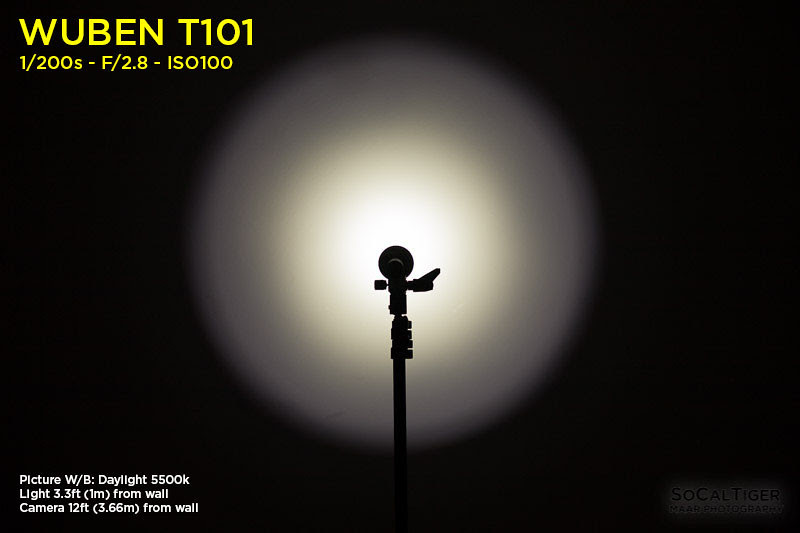 The T101 has a prominent head with defined cooling fins mated to a slender 2x18650 body and provides some substantial heft and size. 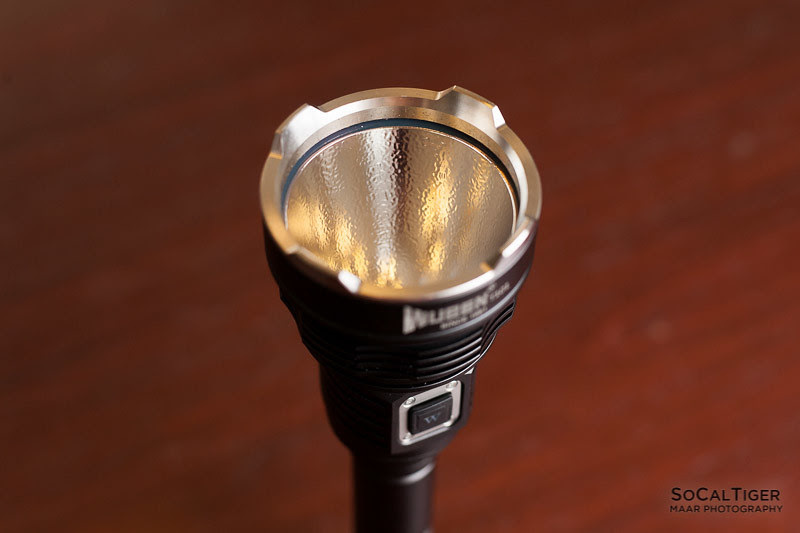 Output is speced at a healthy 3480 lumens on Turbo with a low of 13 lumens. 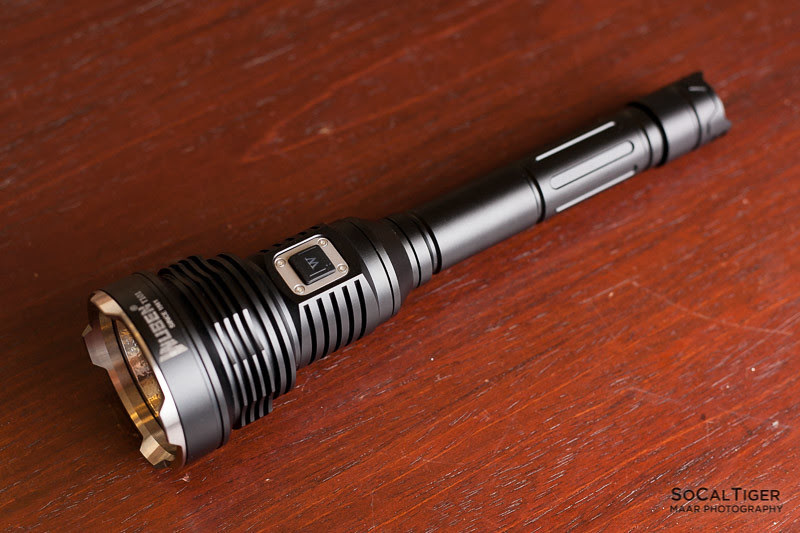 The T101 has built-in charging and comes with 2x18650 IMR batteries which are also protected. This is a really solid light which is excellent for use outdoors, camping, inspiring jealousy in others and blinding all of your neighbors. 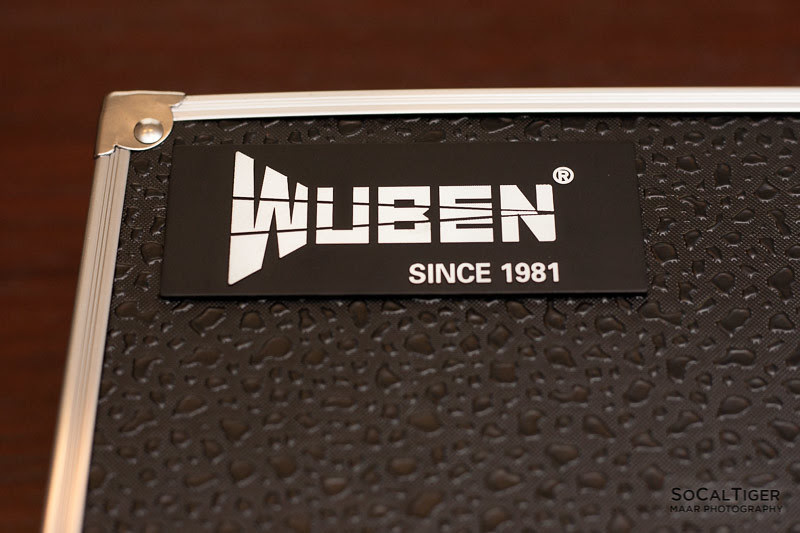 I had the opportunity to evaluate the Wuben T101 and was provided a copy for review by Wuben. 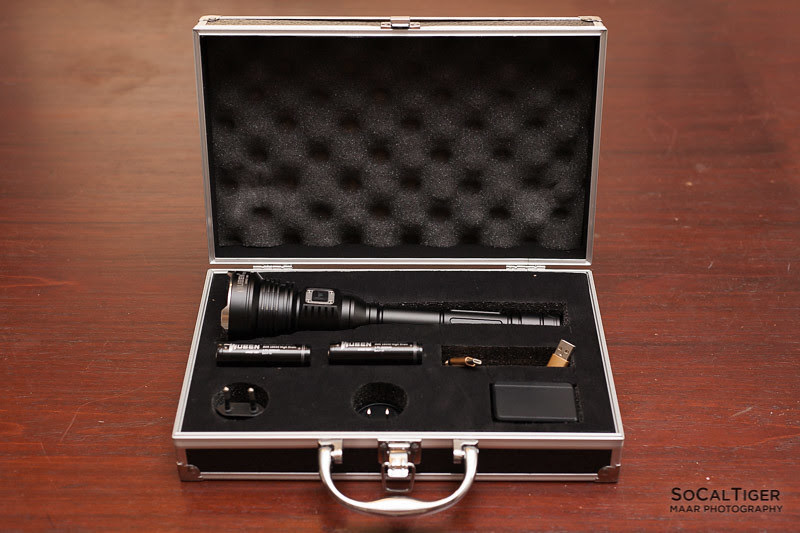 On par with high-end flashlights, the T101 comes in a custom aluminum box. On the outside, the case has a nice water-drop pattern across the surface. The company logo adorns the top-left corner. Inside the box, each item is protected by cut-to-fit foam. When originally shipped to me, the lithium batteries were inside the light although there are slots made to hold the batteries outside of the light (you could also use these to hold spares). There were also 2 spare O-rings and manual in the box along with the charge plug/adapter and cable. The packaging is excellent and protected the light and contents. 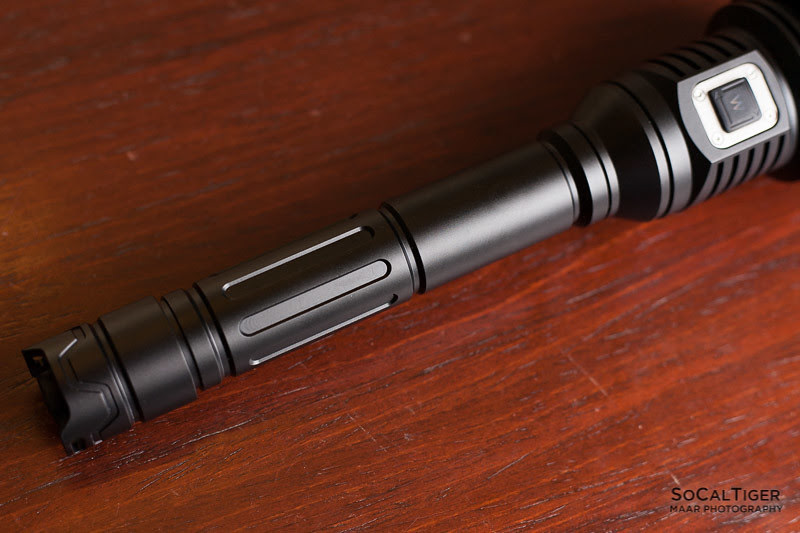 The T101 has smooth black low-gloss anodizing. The anodizing was applied well and my copy did not have any notable defects in the finish. I feel that this finish looks very nice and professional in quality. The body has some oval-ish indentations in the lower half which add grip. The center of balance is where the head and the body mate (about 2-3cm below the side-button). So, in use, I basically hold the light by the top of the battery tube. Comment 1: I really love the look and feel of the fins on the heads. Not only are they stylish but they definitely help with heat dissipation. Even when running the flashlight on Turbo with an ambient temp of 80F (27C), the light never became concerningly hot. Comment 2: I would have liked the indentations in the body to be on both the top and bottom half to help with grip. Comment 3: I originally was unsure about how I would like the slender body with the large head. In person I think it looks a lot better and I do like the design. Plus, the slender body is a littler easier to hold. The side button and style of the head are both really nice. Both stylish and functional. The glass is AR (although you cannot tell from this picture). 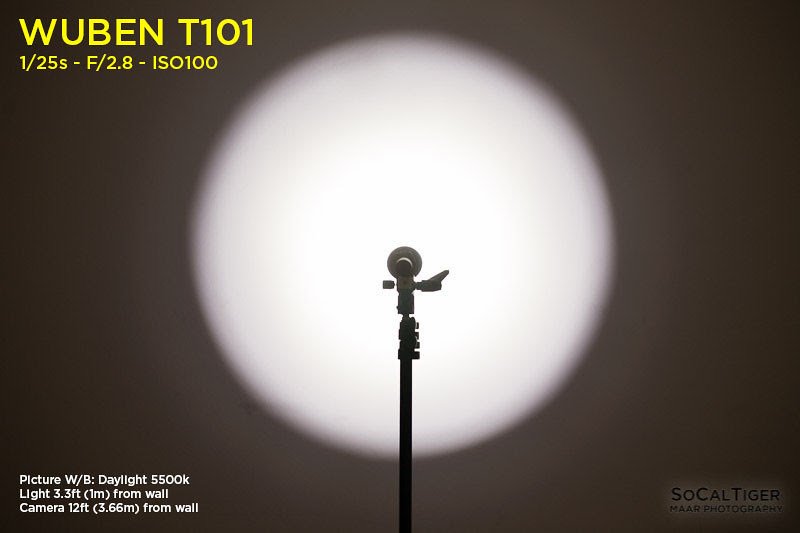 The T101 uses an OP reflector. 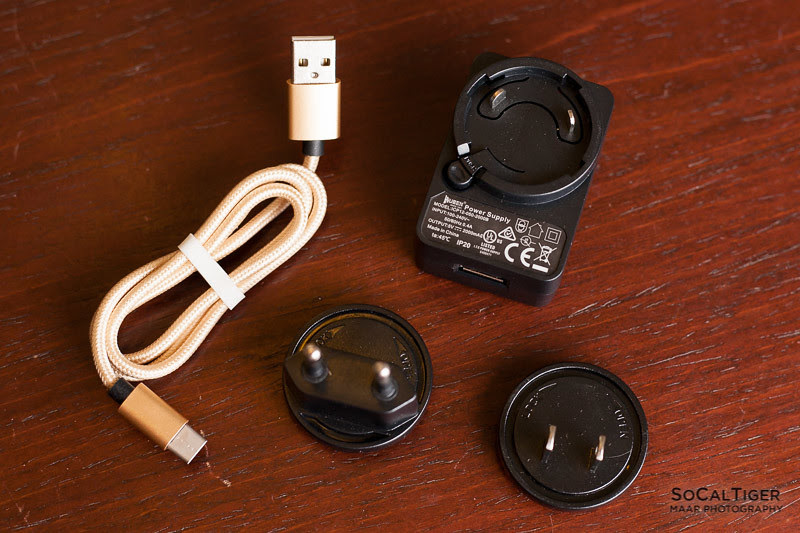 The T101 has a built-in USB-C port for in-light charging and the light comes with both the USB-C cable as well as a power adapter which will work with both US and EU outlet types. The USB-C connection in the back is protected by a rubber cover. Caution: While the T101 comes with protected IMR batteries which are matched at the factory, since the light charges batteries in series, care should be taken to monitor the cells for divergence over time if you are using this feature. I recommend periodically evaluating both batteries as well as rotating the order of the batteries in the light. I do not advise charging in series for someone unwilling to monitor the batteries. 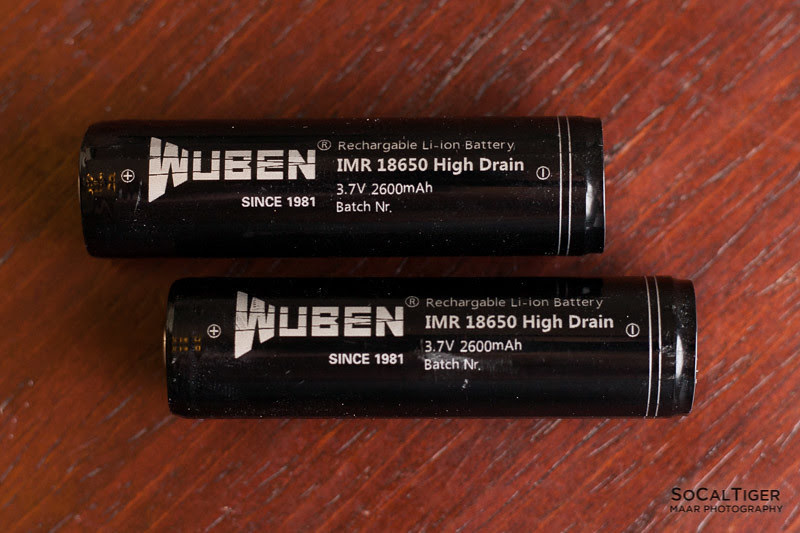 The Wuben T101 includes 2x18650 IMR batteries which are also protected. These are the unicorn of lithium batteries and it's almost impossible to find batteries like this. These are only available from a small handful of sources, usually built by manufacturers and intended for use in specific lights. The combination of using IMR batteries as well as having IC protection allows the batteries to be more tolerant of abuse. The IC protection should prevent the possibility of reverse-charging and external shorts. The batteries that I received were perfectly matched from the factory when measured both at full charge as well as measured after ~1 hour of use. If batteries like this were available for sale, I would buy them and use them in everything. 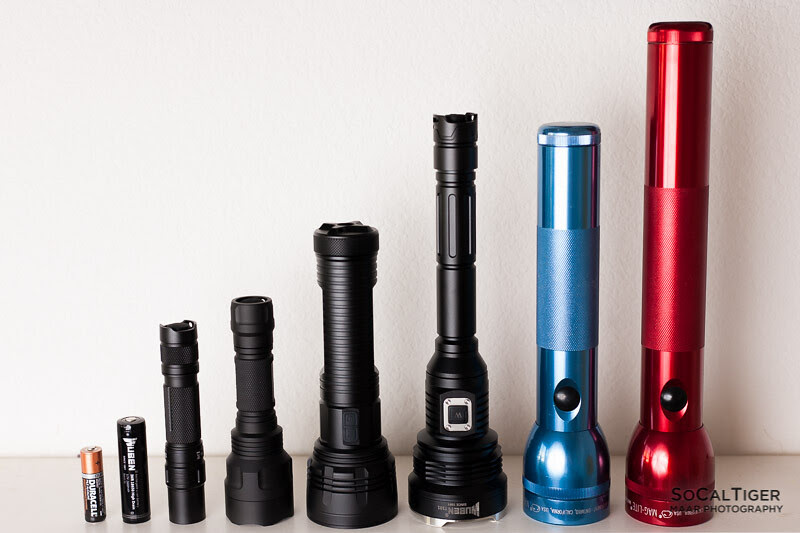 Like all multi-cell lights, I recommend that only matched sets of batteries are used and that the batteries are evaluated periodically for divergence and replaced only with new matched sets. 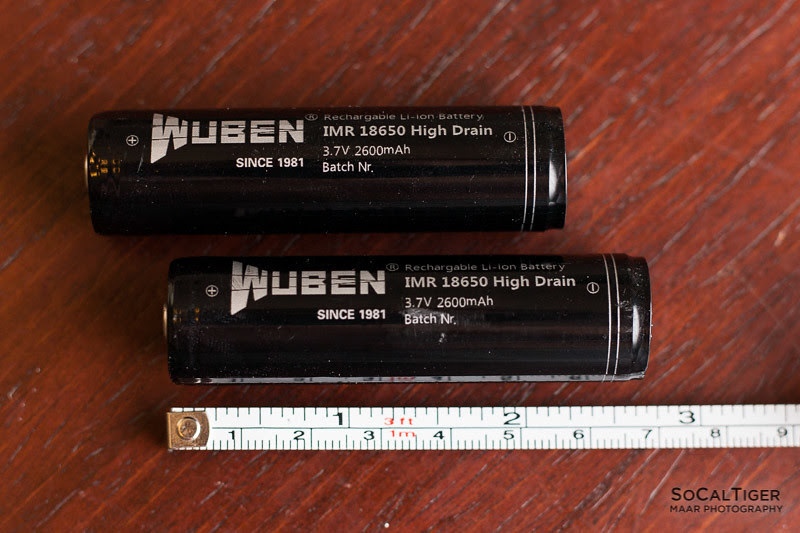 The batteries are button-top and measured almost exactly 67mm. 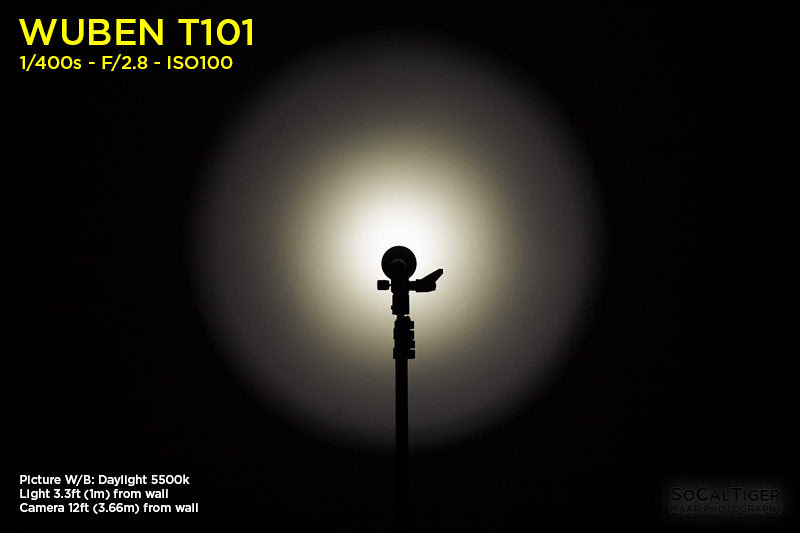 The T101 can technically tail stand. However, due to the slender stance of the body and the top-heaviness of the large head, I would not recommend doing this as it may be easy to knock over the light. The T101, like most lights, can stand on its head. Thanks to the crenelations ("attack fins") on the bezel, if the light is turned on, you can see the light even when upside down. The light is turned on/off with the tail switch (effectively an electronic cut-off) and the power is controlled with an electronic side-button (e-switch). You can also turn off the light using the e-switch alone. The light has memory. To activate MOMENTARY TURBO, hold down the side switch. Release to return to previous mode. To activate STROBE, double-click the side switch. To switch between STROBE and SOS, double-click the side switch again. To EXIT STROBE/SOS, single-click the side switch. 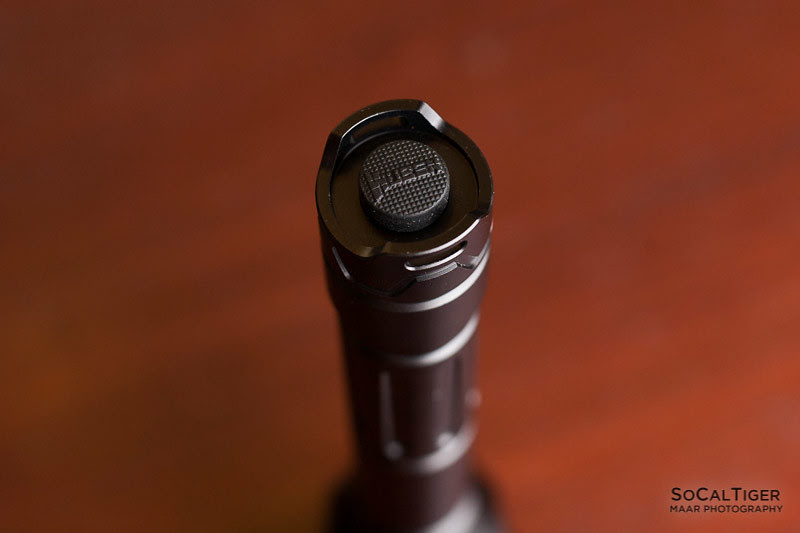 Comment 1: One very nice thing about the side-button is that you can turn the light off from the side. So, if the light will be used frequently, it can be operated solely using the e-switch. For a light with infrequent use or where an accidental press of the side may happen, you can electronically lock-out the light with the tail switch. In addition, you can physically lock out the tail-switch for an extra layer of protection. This is very good. Comment 2: I personally set the light to either Medium or Low before turning it off since it has memory. 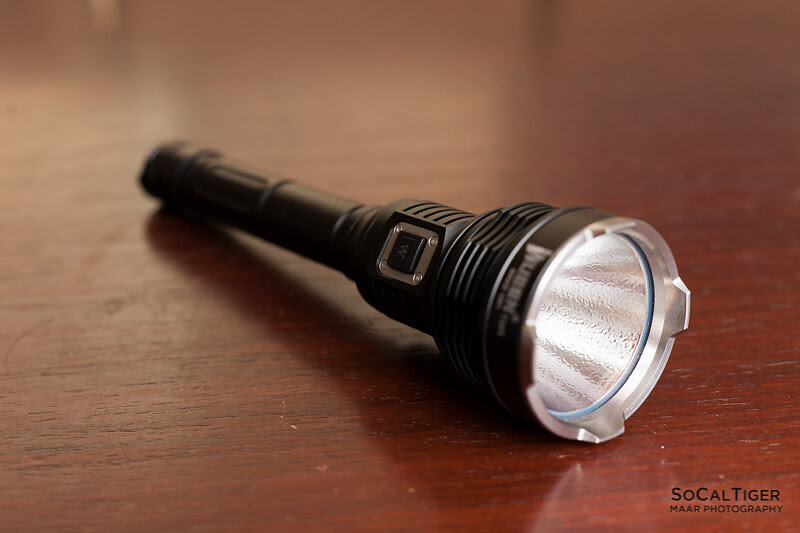 Comment 3: As with all lights that activate strobe/SOS with a double-click, it is possible to accidentally activate this mode if you are trying to change modes too quickly. This happened to me during a real-life test. Personally, I would prefer that these modes are activated with a "long press" instead. I would give up the momentary turbo capability for this (although I know that some people probably like the momentary). Comment 4: My general preference is for lights which start low and go high. 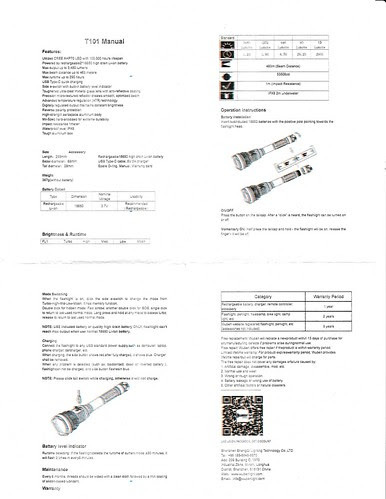 In the draft manual which I received, there are 5 modes specified (Turbo, High, Med, Low and Moon). However, in the version that I received for review, the mode spacing had 4 modes. 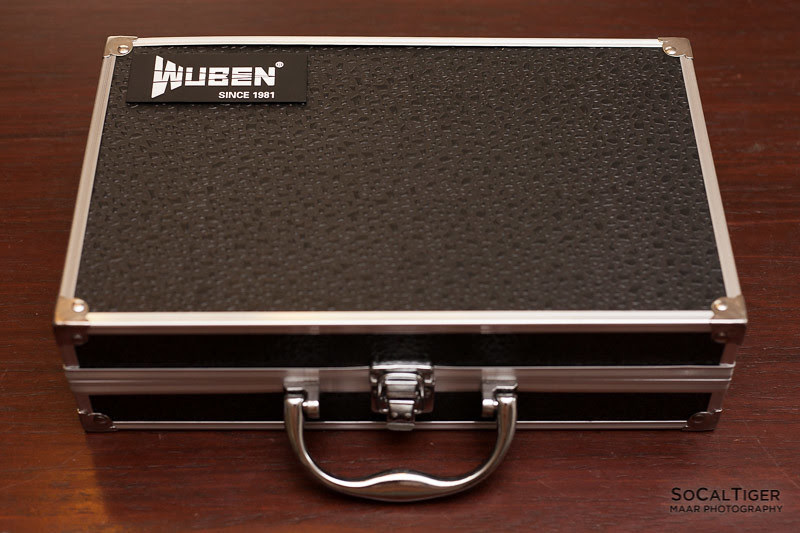 Measurements were done using the provided Wuben 18650 IMRs. Batteries were freshly charged using an Xtar VC4. Batteries were both measuring 4.17V off the charger. Measurements done using a quasi-integrating sphere. I estimate High exceeds spec at roughly 3800+ on activation and 3700+ after 30 seconds. High is 1100+ after 30 seconds. 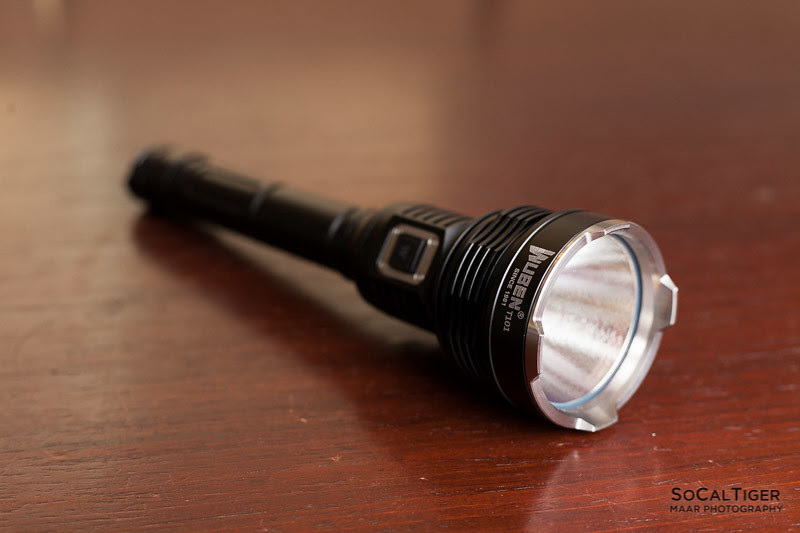 Med is ~250 lumens. 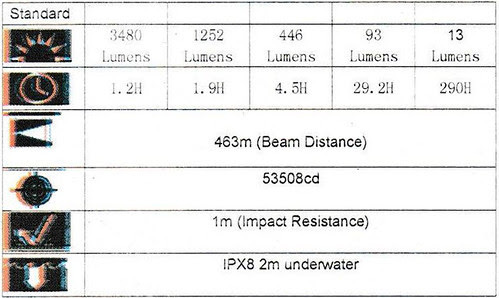 Low is ~13 lumens. * At activation, the light was 3800+ lumens. The light maintained 3600+ lumens before the first ramp down. 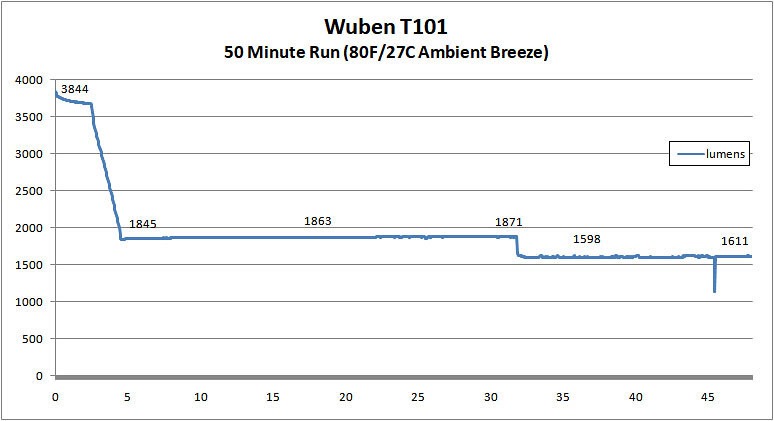 * At ~2.5 minutes, the light began a steady ramp-down over the course of about 1 minute until it reached ~1850 lumens. 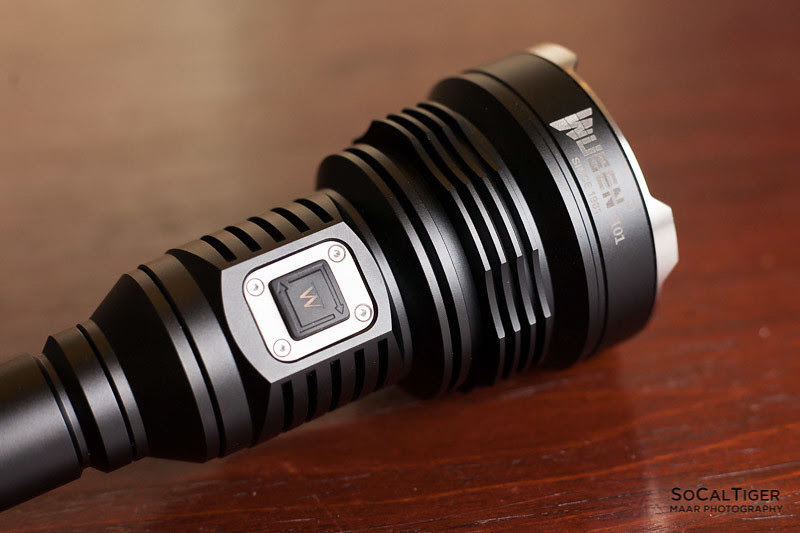 * At ~32 minutes, the light stepped-down to ~1600 lumens. * At ~46 minutes, the light began blinking to indicate that the battery was getting low. 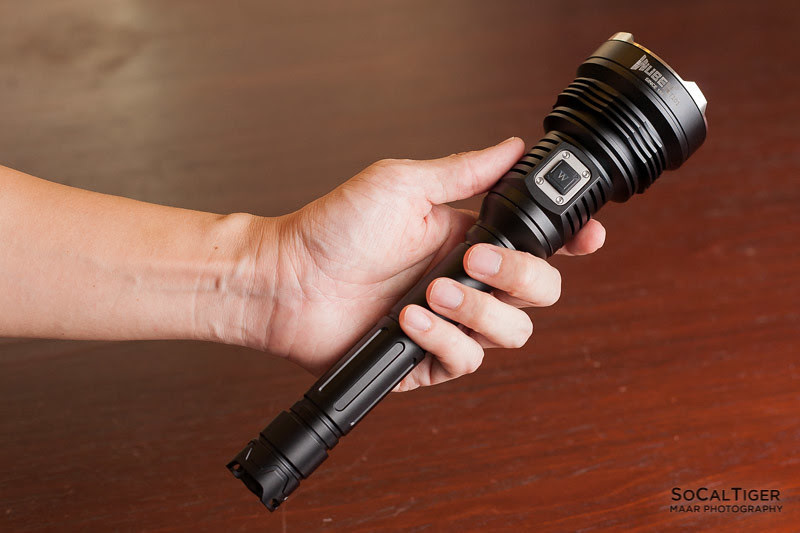 The flashlight is designed to blink 3 times every 5 minutes starting when the flashlight estimates 30 minutes or less runtime is remaining. The flashlight did continue blinking every 5 minutes after the test. Based on the flashlight estimation, runtime would have been approximately 75 minutes which is in-line with the manufacturer spec of 1.2h on Turbo. Of course, using higher-capacity batteries would increase runtime. The batteries both measured 3.67V after approximately 55-60 minutes of run-time on Turbo. General purpose - balanced thrower with bright spill. 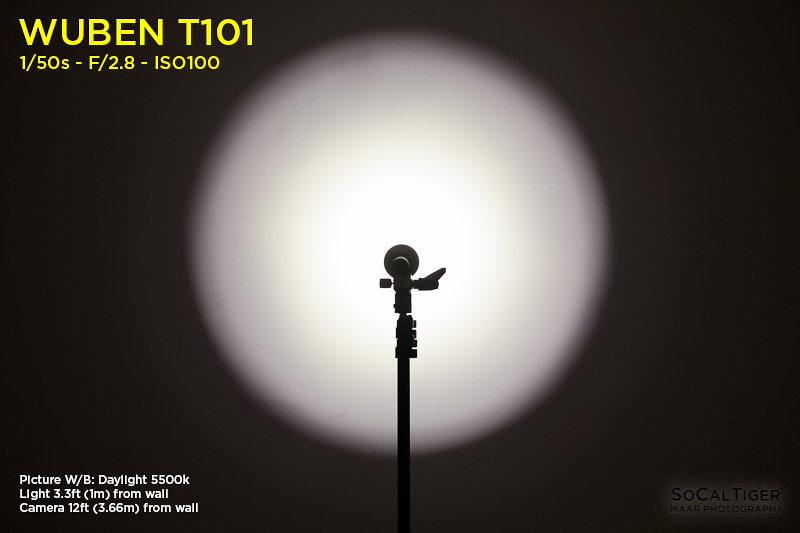 The T101 uses a domed XHP70 combined with a large orange peel reflector. The beam has a great combination of a good throw combined with a lot of bright spill. On turbo, thanks to it's excellent output, there is a tremendous amount of spill. The hot spot is defined but transitions smoothly and the edges of the beam are defined but not sharp. This is an excellent outdoor light. When used indoors, on turbo, I could aim the light at the opposite wall or my large living room and the entire room was lit up as bright as if I had all my lights on. Looking at the hotspot indoors, especially on a white wall, would make your eyes water. The color temperature is 5300-5400K (neutral white) using Lightroom's Auto WB. When white-balanced in Adobe Lightroom against "Daylight 5500K", the beamshots appear neutral. The light appears pure white in practice and this is a good choice of default color temperature. In Lightroom, the color has a minimal green shift of approximately 10 points from Daylight WB (most emitters range from 0-20 points of green shift from Daylight). This is normal and not noticeable to me in real world usage. This slight green shift is the normal result of using AR glass. Personally, I would love if they also had an option for a warmer tint in the neighborhood of 4000-4500K. A warmer color temperature would have less eye strain and also cut through inclement weather conditions better (such as reducing bounce-back in fog or rain). You can electronically lock-out the light by pressing the tail button. You can also physically lock-out the light with just a slight turn of the tail cap. On mine, the tail locked out with a minimal turn, which is very nice. If there is a possibility of accidental activation, you should lock out the light, if possible. I prefer locking out the tail-cap physically for the highest degree of safety when not in use. Pictured next to other lights for comparison. The Maglites are 2D and 3D. 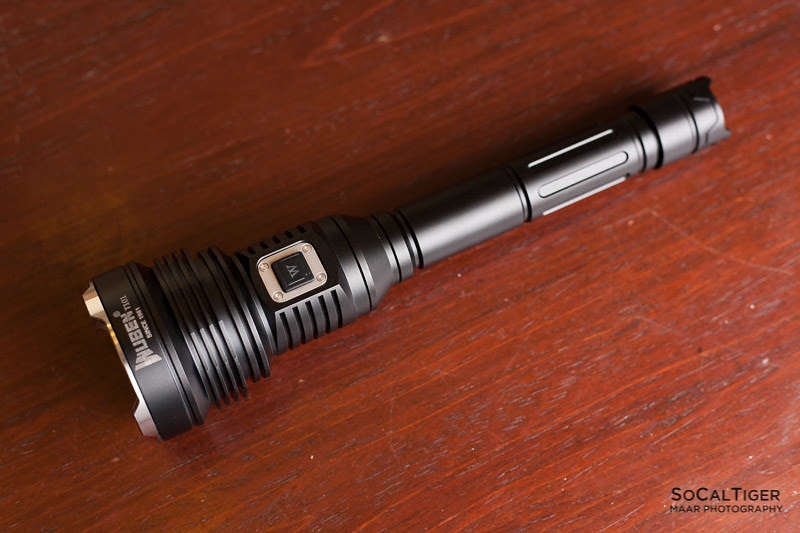 The T101 brings 3700+ lumens with its XHP70 in a form factor which is great for outdoor use. I really like the style of the head and the cooling fins. I think that the light looks great in person. Due to the large amount of metal on the head and extensive heat fins, this light handles heat very well and does not get very hot even on Turbo. The finish has a very nice looking low-gloss anodizing and my copy had no notable finish defects. 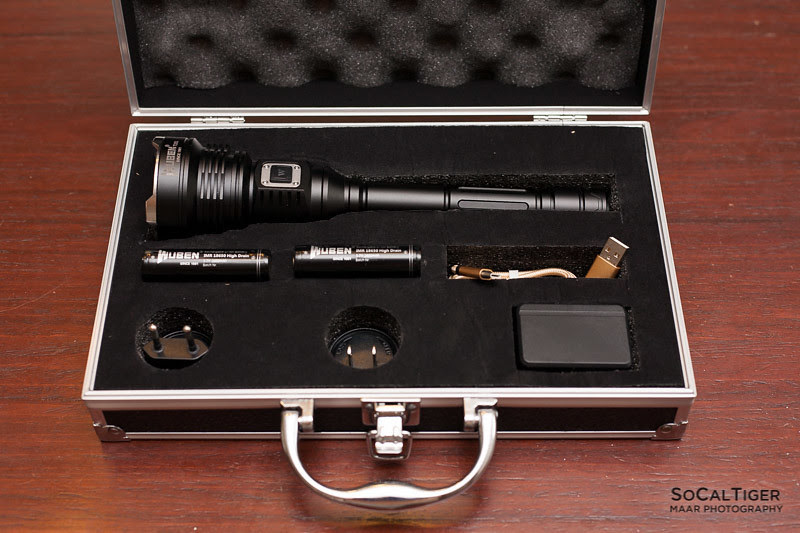 The light uses 2x18650 lithium-ion batteries and includes IC protected IMR batteries. The T101 has a built-in USB-C port for in-light charging. 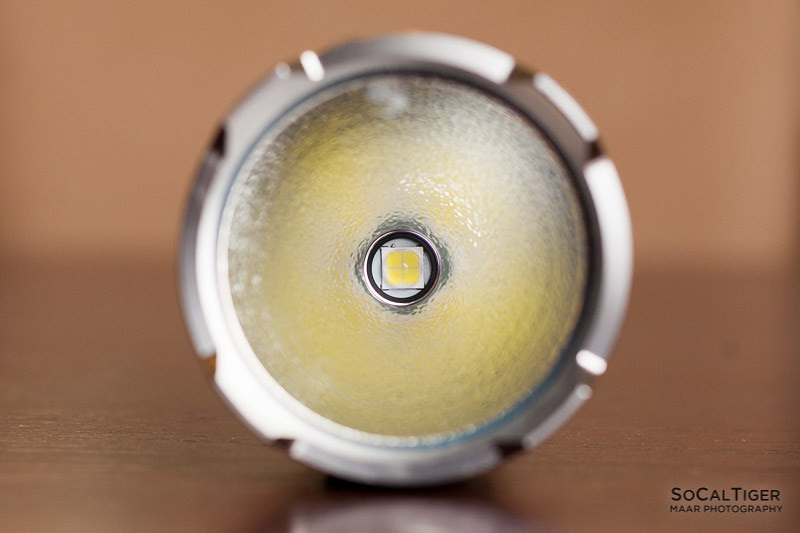 However, like all multi-cell lights, care should be taken to monitor the cells for divergence over time especially if the in-light charging is used. I recommend periodically evaluating both batteries as well as rotating the order of the batteries in the light. Only use matched sets of batteries with this light. The brightness is controlled with an electronic side-switch and the UI is very intuitive. The light can be turned off using either the tail switch or the side switch (the tail switch acts as an electronic cut-off). The mode spacing is nice and simple. My sample had 4 modes although the manual stated 5 modes. 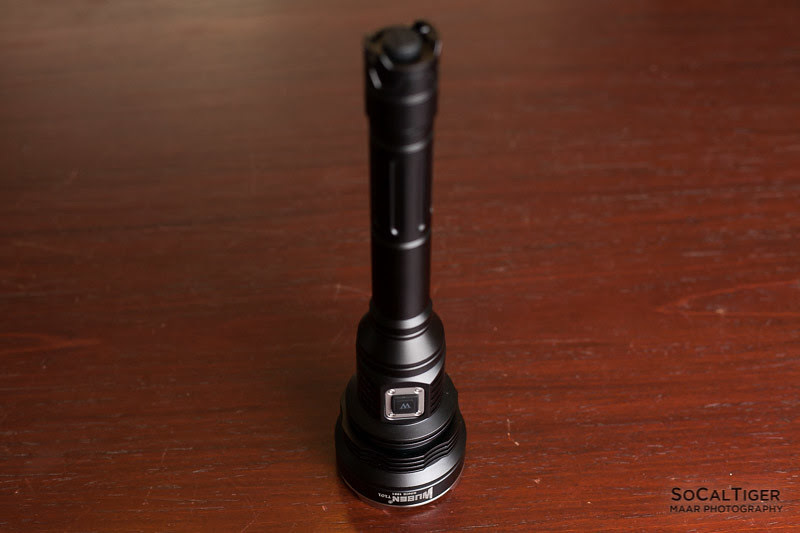 For me, the "Low" of 13 lumens was great for how I use my large flashlights. I would have preferred that the modes go from Low to High (instead of High to Low). I also would have preferred if double-click did not activate Strobe/SOS (can be activated on accident). The beam profile is a balanced general purpose thrower and well-suited for outdoor usage such as camping. The color temp is 5300-5400K (neutral white). It would be great if there was a warm white option as a warmer temperature would provide better visibility in inclement or foggy outdoor weather due to lower refraction (less scatter and bounce-back). They’re not for sale? How would you replace them when the need arises? 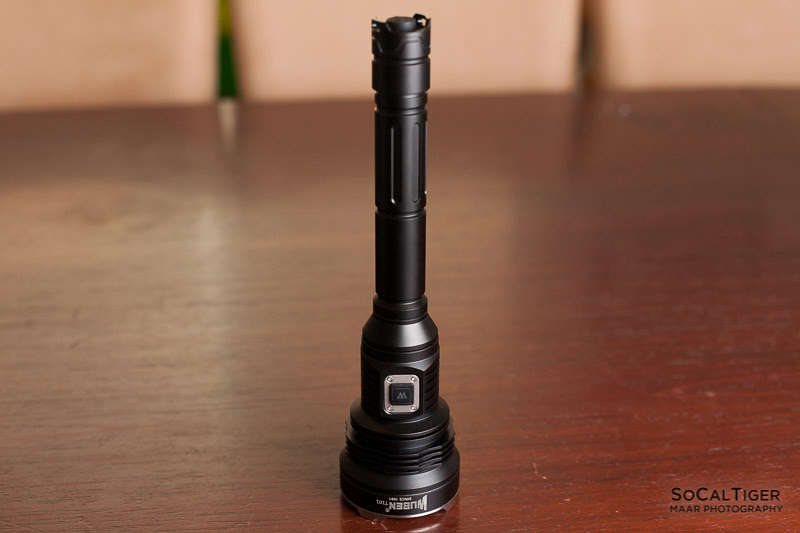 WUBEN Flashlight also have batteries for sale. If batteries like this were available for sale, I would buy them and use them in everything. 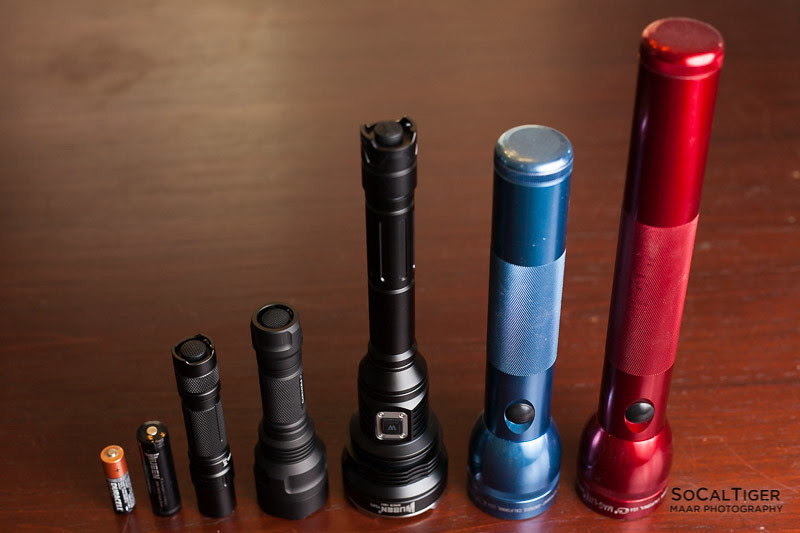 Like all multi-cell lights, I recommend that only matched sets of batteries are used and that the batteries are evaluated periodically for divergence and replaced only with new matched sets. They're not for sale? How would you replace them when the need arises?